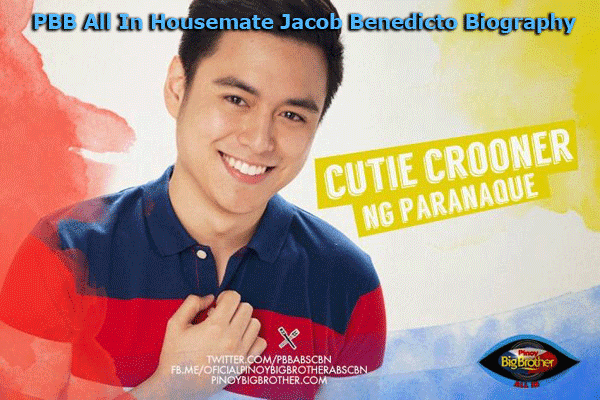 Jacob Benedicto was the thirteenth housemate who entered the PBB house and dubbed as "Cutie Crooner ng Paranaque." Jacob grew up in Indonesia but he is a Filipino. He went back to the Philippines after feeling estranged in the country. Jacob is a total stage performer and this is his talent. He loves performing in the stage and in fact he is one of the semifinalists of “The Voice of the Philippines” season 1. With regards to his education, Jacob is a graduating AB Communication Arts student from De La Salle University. Jacob discovered his talent when he was in Indonesia. The thing is his father lived in there and he was with him until he decided to go back to his own country. Among several of the things that he did in Indonesia was being a drummer of pre-teen band, being cool in school and enjoyed life as it is – something that has so many things to offer. Going back to the Philippines became a challenge to Jacob because of his difficulty of speaking Tagalog. Despite of this, he still found a way to do the things that he wanted to do, like joining a theater and performing in a stage. Jacob’s talent is an indication that he truly was a prodigy. At a very young age, he already has gifts in music. And now that he is already inside the Big Brother House, let’s see how far can his talent go in order to win the crown and be proclaimed as this year’s big winner. His fans have gathered already online in order to support him. If you would like to support Jacob, you can watch PBB All In daily from Monday – Friday only in ABS-CBN Primetime Bida. Don’t miss any episode and be part of the 100-day challenge inside the house.